The N.E. Club once again presented their “Unsung Hero Award”. They have chosen a person whose name has come up in nominations for several years. Judy’s Plaque was specially designed and composed by Chairman Paul Fenton back in 2007 when he was President and instituted the Unsung Hero Award Program which is wholeheartedly supported by the N.E. Club every year. The Plaque reads “In appreciation for all you do in the shadows so others may feel sunshine”. 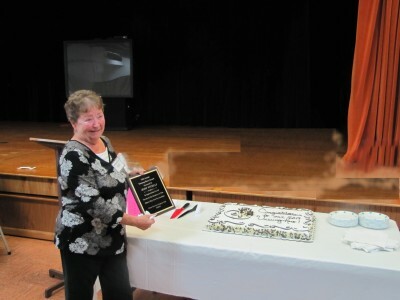 Along with the Plaque, she also received a gift certificate to a local restaurant as well as a specially decorated cake in her honor. Judy was our guest for our Chicken Parmesan Dinner Meeting and she and a guest will also receive another Dinner next year. Judy is the N.E. Club’s 13th Unsung Hero as her countless acts of helpfulness, kindness and generosity in Spanish Lakes are boundless. She is truly an example of “An Unsung Hero”. Gerrie Purcell; Betty Yon; Tom Schneider; Mary Madden; Late Anita Tudino; Joanne Trainor; Russ Marth; Arlene Waggett; Bob McNulty. These Winners as well as Judy will be Honored next year at the Honoree Table. We are fortunate to have in our Village so many people who quietly give of themselves.